Please note:Orders of 151 pounds or more will be shipped via Freight carrier and our Oversized Item Delivery/Return policy will apply. Please click here for more information. "The picture does not look like there is an umbrella hole but I saw one question and answer that says it does. DOES it have an umbrella hole??" This table does have an umbrella hole. "What is the weight limit for the chairs?" We apologize for any inconvenience, we are not provided with a maximum weight limit for this item. "What type of wood is the table made off?" Hello TM, this set is made from yellow balau hardwood. Thank you for shopping with us! "Is there a slot for umbrella when the extension is not used? It appears from the picture that umbrella hole is only on the extension." Hello clrcknsl. 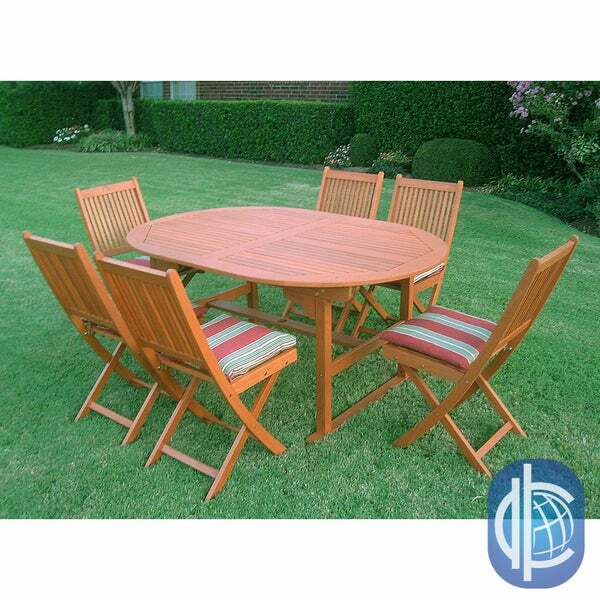 Thank you for your interest in the Royal Tahiti "Palma" Seven Piece Outdoor Dining Group Oval Butterfly Extension Table. Yes there is a slot for the umbrella whether your using the extension or not. I hope this helps, and thanks for shopping with us. You can create an outdoor oasis no matter the size of your patio or deck space. Purchase a complete set of furniture or create a perfect custom combination from these essential patio furniture pieces. Here are some things to consider that will help you choose the right patio furniture for your outdoor space.